Girl Time - Family Times is an award-winning magazine with staff-written news, feature stories and artwork that inform and inspire Central New York parents and their children. Cover model Kimberly Rossi and her daughters, Ashlen, Olivia and Madison, volunteer for a henna demonstration. Winter is when I get creative and have my daughters or friends join me for a henna party. And it can be done any time of the year. Mehndi is the art of painting designs on the body with henna. It has been practiced for thousands of years in India, parts of Africa such as Morocco, and Middle Eastern countries. Crushing the leaves of the henna plant into powder, a paste is made that temporarily stains the top layer of skin. In some countries it has been used medicinally for its cooling properties. Believed to bring luck, prosperity and love, mehndi is included in many rituals and ceremonies. It’s also a way for mothers and daughters or female friends to bond with one another. I think it’s cool. When else can you be original and daring by drawing beautiful patterns on your body and feel good about yourself? PREP WORK Send afternoon invitations in advance. Invite whoever would be open to body art. I have a close-knit relationship with my mom and aunts, so they’re there, along with my friends and daughters. I remind everyone of skin care before the party, such as exfoliating and wearing loose fitting clothing. It’s important for the outer layer of skin to be freshly scrubbed and free of lotions and oils. The supplies are sold in complete kits everywhere. Order online or purchase from shops such as The Art Store/Commercial Art Supply (935 Erie Blvd. E., Syracuse; 474-1000), Michaels or AC Moore. Some sell henna in pens and others are packaged as a dry powder in a small bottle. I’ve only used the dry powder bottles because I know it will make enough henna for several people to have at least two or three generously sized designs. Prices range from $12 to $35 depending on the accessories included. All should come with an instruction booklet, illustrations, templates and henna materials. Some kits have colored markers specifically for skin. It’s important to read all labels because some products should be avoided. Black henna, not necessarily the color of the mixture, is made with chemicals that can cause allergic reactions, such as p-phenylenediamine (PPD), a coal-tar hair dye. Also, henna shouldn’t be used if you’ve colored your hair within two weeks. I’ve never had a problem with what I’ve bought locally, but it’s important to research. Mix ingredients ahead of time by adding water and eucalyptus oil to the powder. Some directions suggest the henna age for a few hours before use. I spend the wait time making hors d’oeuvres and straightening the house. ROLL UP YOUR SLEEVES After my guests have arrived and gotten settled with refreshments, we begin. They usually have an idea where they’d like their art. It must be where clothing won’t get in the way, such as ankles, legs, wrists and hands. Also, the area must be able to dry without being touched for a few hours. Family Times found kits at Michaels and The Art Store/Commercial Art Supply. I’m clever enough to apply henna freehand for everyone, but if a friend is artistically talented, I have her do it. My youngest daughter has some impressive artistic skills. Some transfers can also be cut out and used like a tattoo to ensure perfection. Common designs are flowers, suns, circles and filigree-like vines. The pasty solution will be wet and feel cool for a while. The applicator tip must be kept clean, but if a mistake is made it’s easy to fix with a wet washcloth. Embellish on the designs supplied, mix them together or use something else that’s inspiring. I like to use the Celtic drawings that are in my kids’ storybooks. Be original! 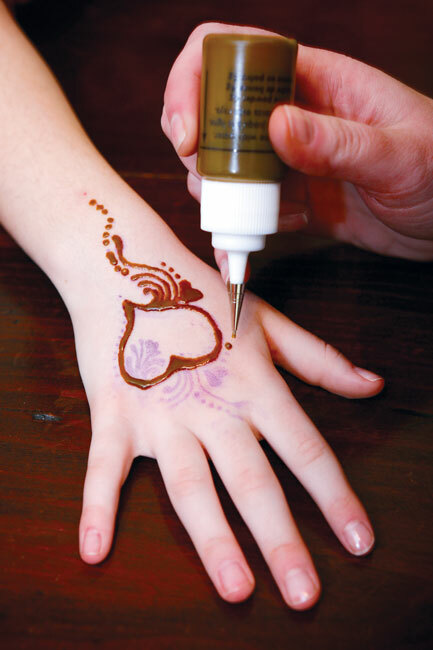 If you don’t want to use henna free hand, especially the first time, make a stencil. Print out a design you like and trace over it using a non-toxic, water-based marker. lift the paper, the design will be on the skin, ready for the application of henna paste. As henna sets, it will become flakey. If some of the dried henna cracks and falls off early, no big deal. Most times it won’t affect the art. While our handiwork dries, we munch and mingle. An earlier party is best, but if my get-together is in the evening the kits include directions to cover the artwork while you sleep. After it’s been on for a few hours, I rub off the remaining henna flakes with my finger. Washing the day after is fine. I protect my henna by putting a small amount of baby oil over the designs before showering and pat it dry. 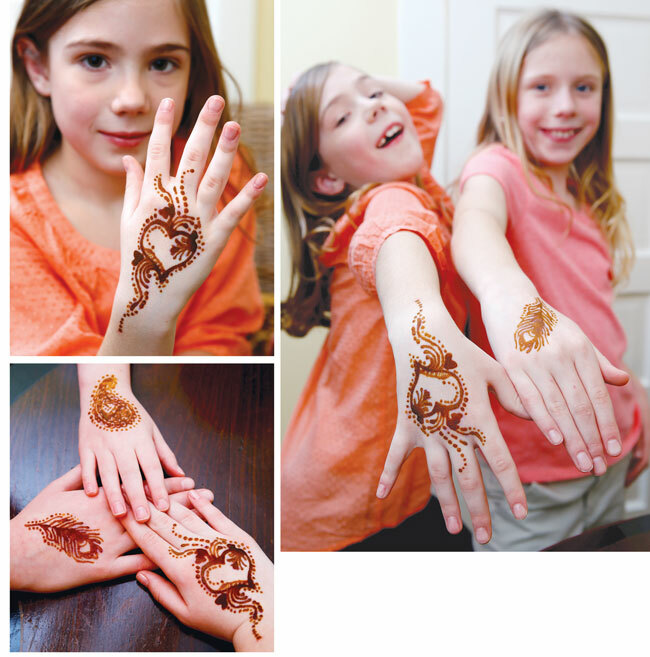 Henna parties are easy and inexpensive to have. It’s a beautifully exotic way to chase away the winter blahs. 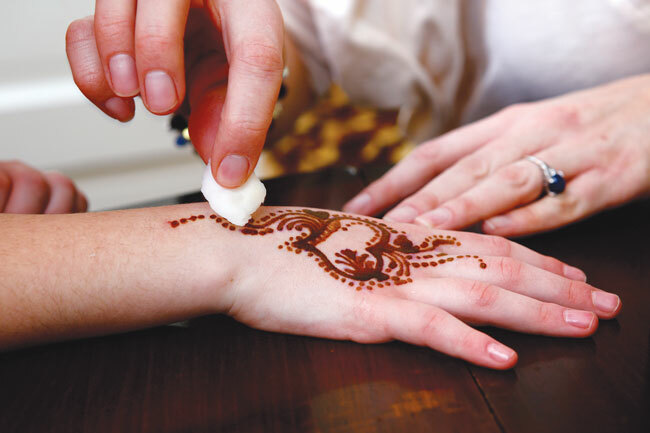 Once the henna is dry to the touch, lightly dab on the sugar solution to set the design. A heart, a feather and a paisley element were fetching motifs for beginning henna artists—and models!